It's only been a couple of days since the last beta so there's not a lot of new stuff, but we thought it would be best to leave you with a fresh beta for the weekend. Added Seamless Edges option to fuselage parts in Part Properties. I debated on releasing this feature because it is experimental and in some cases actually may result in worse looking edges (two cones connected with same slope). However, in many cases, it does work well and gets rid of seams, most notably when connecting a cone to a cylinder (ie - nose cone to a fuel tank). So if it looks better, use it. If it looks worse, then don't use it. Fixed a bug where the designer would break if a wing with a control surface was deleted. Fixed bug where some parts would fail to highlight when selected after being detached in flight scene. Changed threshold required for an RCS to be assigned to an axis. Fixes issue where smaller craft may not respond to RCS input. Fixed a bug where delta V was not calculated correctly when uploaded to the website or when viewed in the main menu. Fixed a bug with the rotators using incorrect rotation angles after saving and reloading the flight state. Smoothly transition between lit and dark smoke particles when entering/exiting a sunlit position. Fade smoke out with increasing size of exhaust plume. @Kell Never is, MRM-106D RCS Thrusters on DCSS produce only 40N/27N depends on the ports. @LiamW I agree. But 50% is enough for most usage. @LiamW The current lower limit is 50%. You might want to update to the newest beta. 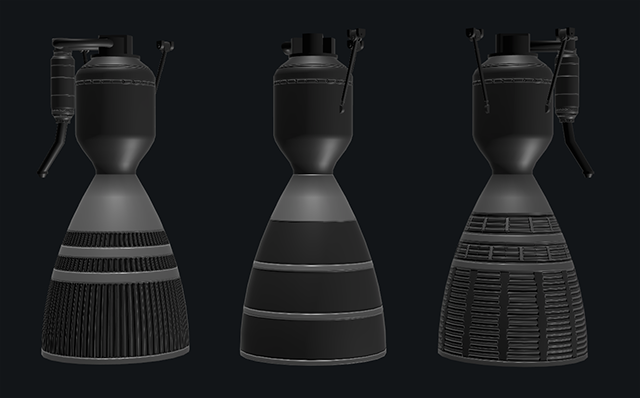 @AndrewGarrison Any chance you can add vectoring capability to the solid engines? I know the Shuttle SRBs had gimbal actuators that allowed for 8 degrees while the SLS variants allow 5 degrees. Also notable is that I can only go up to 200% in size on the Solids, which is not big enough when compared to the SSME nozzle. I guess I'd have to edit the XML for this? Hey andrew, I am a big fan of SR2. I would really like to see scientific payload/gizmos such as a weather or terrain mapper. @MarioG Agreed, there are some more factors effecting plume color. RS-68 has orange tinted plume since its nozzle is not regen cooled but ablative cooled and the ablator makes orange gas. @Kell was it so was it supposed to be completely blue? @MarioG The Raptor wasn’t supposed to have a greenish exhaust. It’s copper contaminant. @AnotherFireFox lol, I can add in some XML mod options to override the efficiency settings. @MarioG Kell asked for that too. We don't have time to add it now, but maybe someday. It is an elegant power cycle.